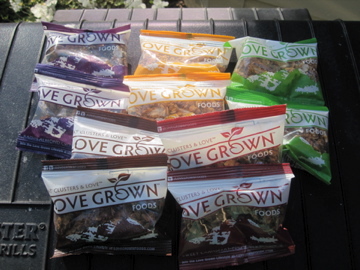 I told you it’d be coming…a Love Grown Foods Granola Giveaway! 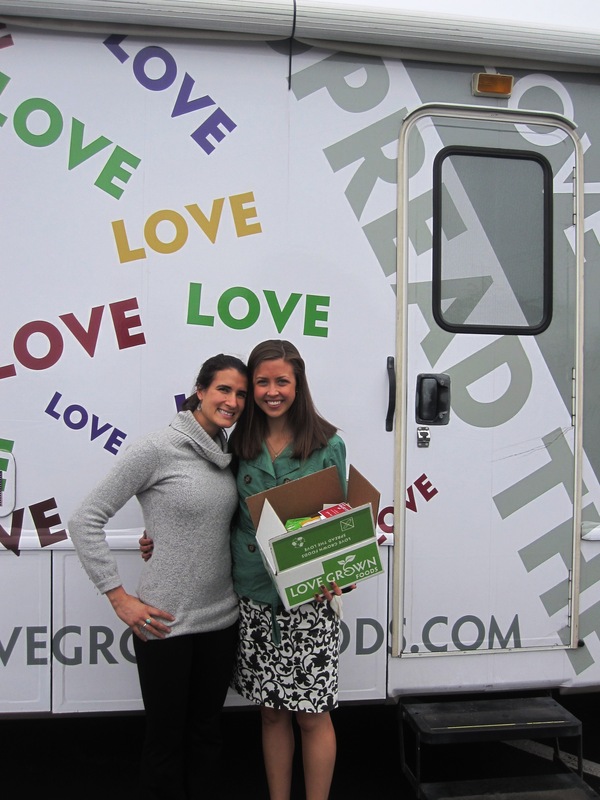 Earlier this week I had the good fortune to meet Maddy, a co-founder of Love Grown Foods, while she was driving across the country. Maddy gifted me with tons of Granola and this stuff is way too good not to share with you all. There will be TWO WINNERS of this giveaway. The first lucky guy or gal will win one full-sized bag of Simply Oats along with a sample pack of each of the other four flavors: Sweet Cranberry Pecan, Apple Walnut Delight, Raisin Almond Crunch, and Cocoa Goodness. The second winner will win TWO sample packs of each of the five flavors. There are four ways to enter and you do NOT have to have a blog to win. Please leave a comment for each entry. I’ll choose the winners using a random number generator on Sunday 5/8. GOOD LUCK! And liked you on Facebook (didn’t know you were on there!!)! I hugged one of my bffs! ive spread the love by walking my puppy! I was extra nice to some of my coworkers that are not always so nice to me! Sometimes its hard but I say Kill em with kindness! I also posted about your giveaway on my blog! I made (& froze) my boyfriend a lentil loaf for lunches next week so he could avoid buying processed meals. I give compliments whenever I can! I spread the love by teaching my 29 Pre-K students today 🙂 they are the heart of my heart! Talk to my best girlfriend and told her how much I miss her! I also washed my blankets on my bed haha. Bed love! I spread love by showing compassion towards some of my patients at work! I follow you on twitter @butterjessfly and I tweeted! I made breakfast for my sister before waking her up to go for a mid-morning workout! I’ve spread the love be sending my bf an encouraging text about his last final of college, which is today! Today, I finished my Masters degree. I spread lots of love through “hip, hip, hoorays” and “congratulations” to fellow graduates. It’s a good day! I spent some time with a friend today who needed it! I would say that I spread the love by posting on my blog today, its the best way to stay in touch with so many wonderful people! I did some extra favors for my coworker. I spread love by making dinner for me and my man..cinco de mayo style! I brought back homemade cookies for my roommates! I mentioned it on my blog! I paid for someone’s copies at the copy machine when she didn’t have any change! I made muffins for my neighbor! At the Starbucks drive through I paid for the coffee for the car behind me. Bet they smiled when they go to the window. I follow you and tweeted about it! I made coffee and breakfast for everyone today! Yum! That granola looks fabulous! hmm I’ve been in the library all day for finals so the only love I’ve spread is the love I’ve been showing my papers. But yesterday I brought my sick friend hot chocolate! i ran around the library (finals week) handing out chocolate chip cookies silently! i spread love by catching up with a friend after quite a few months! I grabbed medicine for a sick friend. Oh my goodnesss… I love this! I spread the love today by giving my mom a call this evening when I knew she was feeling stressed. I think it helped! I cleaned the long-neglected microwave in the break room at work today! Spreading the love and halting germs all in a day’s work. I called my grandmother and wished her a happy birthday! I also left the waiter a generous tip. I liked you on FB! 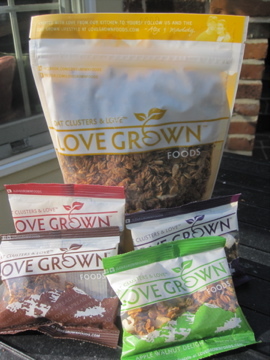 Love the blog clare and would love to try this granola that everyone is talking about! I spread the love by praying with my kiddos- and then listened intently to my 4 year old tell me about heaven and what he is going to do when he gets there and how I need to go with him so that he doesn’t get lost. Priceless! i spread love by sending postcards to friends and family while on vacation. i know everyone loves postcards! I spread the love by treating my fiancee and I to a Cinco de Mayo dinner after a rough day for the both of us! I spread the love today by getting dinner with a friend who’s been down lately! I mentioned you on my blog tomorrow morning! I responded very nicely to a customer at work while she yelled at me and was very insulting. I spread the love by babysitting my friend’s daughter while she went on a date, as well as helping cook dinner for 2 of my closest friends! Awesome! You should be their spokesperson.. You look like a natural!! I spread love by working extra hard, because one of my coworkers was sick and needed to take it easy today & spreading a lot of love to my puppies! This is hard because I just woke up…but I guess I’ve spread love to my dog by giving her her breakfast…? lol. I follow love grown foods on twitter! This granola is everyone on the blog world! I’ll spread the love by helping my roommates clean up and carry their bags since they’re moving out of the apartment today. To spread the love I sent my best friend an email telling her how much I miss her. She lives in New Orleans. I spread love today making a fun breakfast for my son: fresh banana and strawberry rounds drizzled with chocolate melted with coconut oil + coconut milk + homemade muffin, he said he loved it! When you spread love it comes right back at ya! This is such a nice giveaway, granola (oats in all forms really!) is one of my favorite things and I would love to try this one! I spread the love by going grocery shopping for my mom!! I spread the love by posting operation beautiful notes today! I sent flowers for mother’s day. and i was SO surprised to see this picture on your blog– Maddy is a camp friend (from a million summers ago) and i have not kept in touch well at all. What a small world! I’m so impressed with her company!! I spread love today by saying “Hi” to people I do not know when I walk around my office! I liked you on Facebook!!!!! i am starting the prep for a mother’s day brunch for my mom! I bought the woman in line behind me at dunkin this morning a coffee, she said it made her whole week 🙂 I love random acts of kindness..and granola! I spread love by sending my mom a mother’s day card! I fixxed breakfast for my sister in law and my niece! I called my mom, knowing my dad was out of town and she might be feeling lonely. This prompted me to also call my Baba (Ukrainian Grandma), because I don’t see her very often. I am already a follower on twitter and tweeted about the giveaway! I can’t believe I wasn’t already following you on Twitter! I am now 🙂 and tweeted your contest. Spread love… I spread love when my roommate who I’ve lived with for three years left this morning. She’ll be back for one night when she graduates next week, but it was sad saying bye! But I guess we can spread our love (more like friendship) from Mississippi to Alabama next year. I like “Fitting it all in” on FB! I have a link to your giveaway on my blog! I sent my grandparents a package with homemade cookies – cookies made with love – it is love in a box! It will make their day! I made breakfast for my mom, and I’m planning a Mother’s Day Brunch – should be exciting! I helped my mom still weigh the pros and cons of something she wasn’t sure she would buy (a technological item). I’m following you on twitter now and I tweeted about the giveaway. I’ve spread the love today by cleaning the house for my roommates who have been stressed lately and I called my mom just to say hi! I spread love today by making cinnamon-banana pancakes for my family! I tweeted about the giveaway girl! today i spread the love by having a heart-to-heart with my roommate when she was feeling down! Shared love making a phone call, and saying I love you. I miss you. I bought a sandwich for a homeless man- it made me feel good! I reeeaaally want to try this granola- its not sold where I live- BOO!